Last month I posted a poll to ask everyone what this is. Twenty four people voted. 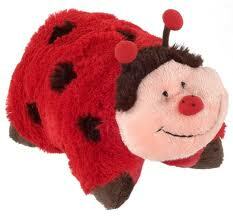 Two voted that it is a cow (8%) and twenty two voted that it is a lady bug (91%). I think I didn't explain Lost Boy's reasoning behind it being a cow very well. Lost Boy argues that a cow has spots, horns, and four legs. This little pillow pal has spots, horns (arguably), and four legs. When I argue that it's a ladybug because it is red, and has antennae (not horns), Lost Boy points out that it does not have six legs as lady bugs do. in color. But I think it needed it. The general consensus it that this is a lady bug. But if you ever hear us referring to a cow, you'll know what we're really talking about!